From the bottom upRun, cycle, walk, paddle, skate, ski from the bottom up to the top! In Summer 2015, our Volcanic Seven Summits project has brought us to Tanzania: we climbed Mount Kilimajaro, 5895 m, from the lowest point of Tanzania, the shore of the Indian Ocean in Tanga. Read about past and upcoming Bottom Up Climbs! What do a high school teacher, a software developer and an ultra runner have in common? Bottom Up Switzerland. She made it! On Thursday, July 30, Anne-Marie completed her 5 days run from the bottom to the top of Switzerland. She wrote a detailed report in German on her blog. The English version is now on line on Bottom Up Climbs. Here you can have a look at some pictures. A film crew was with Anne for the whole duration of her run, we are all looking forward to seeing the result of their amazing work! In the meanwhile, read the story from their viewpoint here. Click here for general information about Anne’s journey. Here below you can read some short comments she sent almost live. Anne and Cristian reached the top of the Dufourspitze today around 12. The conditions were made hard by the storm which blocked them yesterday: a lot of new snow on the route, ice on the fixed ropes in the final couloir. They are now safe in the Monterosahütte and enthusiastic for the success of the climb. As expected, massive thunderstorm, heavy rainfall and some snow today at the Monterosahütte. Day spent resting, waiting and for some team building, now that all the members of the summit team have reached the hut. 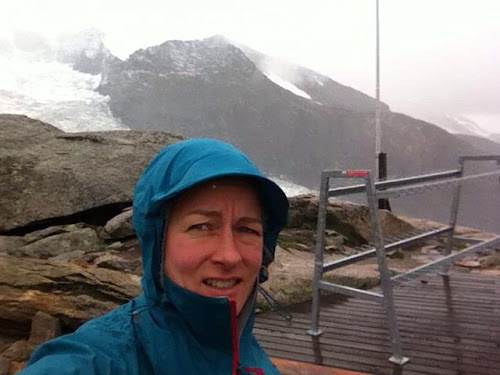 After a tough 8-hour hike, Anne and the camera team have reached the Monterosahütte, just before a front rolled in bringing clouds, rain and snow. Anne is in Zermatt, taking some rest before the big final climb. The weather forecasts for Monday are really bad, so the summit has been rescheduled for Tuesday, July 30. Stay tuned! Arrived in Zermatt after 67 km, some altitude of 1500 m and 7h45.. It was a great day with some little crisis between Visp and St. Nikolaus, but when I finally saw the Matterhorn every pain was gone… Now eating and resting to be ready for the big mountain! Despite some troubles with the GPS today, Anne has arrived in in Fiesch, after 8h30m of alpine running. Here is her freshest comment, just after arrival. Just arrived in Fiesch after 62 km, 2200 km up and 2900 m down in 8h30min. It was a fantastic day. Sun was shining very strong. The morning was beautiful at the mountain hut Basodino, followed by 12 km of hiking through snow. Then Nufenen pass and further to Ulrichen after 40 km. 2 hours to Fiesch. Now my feet are burning! But the day was great especially that part at the Cristallina! Some steep snow couloirs but no problem. I reached Ulrichen after 6 hours. Then in the 2 hours to Fiesch I pushed it very hard. Last 8 km on road what was fast but awful. Just had my punk music on and kept going. Scenery is great and weather a bit too warm for me. But I enjoy it!! Anne-Marie has left Ascona at around 6.20. Just 20 km and 1200 m of altitude to go to CAS Basodino Hut! I’m happy and sun is shining! Anne-Marie and the camera team have arrived at the Capanna Basodino in the afternoon after a beautiful and rewarding day. A few comments on her day. Start in ascona at the Romantik Hotel Castello Seeschloss early in the morning. Fast stage until Bignasco with some beautiful spots and green lakes and nice trail running parts! From bignasco to San Carlo only on the road with hot temperatures. Finally got to the hiking trail to the hut. First part was very steep and I struggled a bit because I was sweating a lot and losing too much electrolytes. I was pushing myself through the forest and ate everything I had in my backpack. Appenzeller Biberli, crackers, nuts. After 1 h and 900 vertical meters reached the hut. It is a really nice hut with a funny hut manager Ueli! Live position of Anne-Marie running her Bottomup Switzerland! Here you can follow Anne during her journey. The position is updated every 5 minutes, reload the page to see the updated position! To stay updated on more details of her journey, visit this page and bookmark it. You can also follow us on Facebook and Twitter. BUC CH: ride, walk, climb, ski. Day Four. Summit day. Incredibly long, including the exhausting retour walk to Rotenboden, but incredibly rewarding. We made it! 2200 vertical meters and 5200 kcal. Scroll down for all the pictures! BUC CH: ride, walk, climb, ski. Day Three. Up to Rotenboden, down to the glacier, and then again up to the Monterosahütte. 16 km, 1600 vertical meters, 2700 kcal. BUC CH: ride, walk, climb, ski. Day Two. It was supposed to be an easy day. It got a little more complicated. Read Justin’s report. 89 km, 1200 vertical meters, 1900 kcal. BUC CH: ride, walk, climb, ski. Day Zero. BUC CH: ride, walk, climb, ski. Day One. We left Ascona and cycled over the Nufenenpass (2478 m) to end up or day in Ulrichen. 120 km, 2400 vertical meters (and 3500 kcal, says my heartbeat monitor).